In this paper we develop an open multiclass queuing network model to describe the behavior of short-lived TCP connections sharing a common IP network for the transfer of TCP segments. The queuing network model is paired with a simple model of the IP network, and the two models are solved through an iterative procedure. 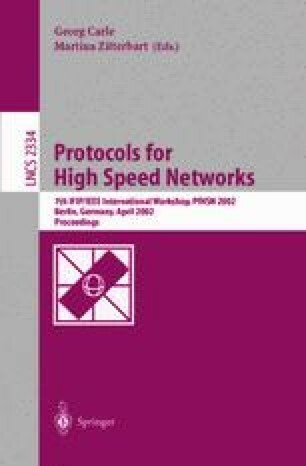 The combined model needs as inputs only the primitive network parameters, and produces estimates of the packet loss probability, the round trip time, the TCP connection throughput, and of the average TCP connection completion time (that is, of the average time necessary to transfer a file with given size over a TCP connection). The model presentation is centered on TCP-Tahoe, but the model of TCP-Reno is also available and results are presented. The analytical performance predictions are validated against detailed simulation experiments in a realistic networking scenario, proving that the proposed modeling approach is accurate. This work was supported by the Italian Ministry for University and Scientific Research through the PLANET-IP Project. ns-2, network simulator (ver.2). LBL, http://www-mash.cs.berkeley.edu/ns.